Over the past 25 years the global development community has invested $105.34 billion in the health of the world’s poorest. Of this, 23% ($105 billion) has been spent on the prevention, management and treatment of HIV/AIDS. And not without results: with peaks in 2004 and 2006, the number of AIDS-related mortalities have halved and the total number of new infections has dropped by more than a third. No longer the death sentence it once was, today almost 50% of people living with HIV receive ART – a combination therapy so effective that life-expectancy rates can equal those living without HIV in the same communities. But take a closer look at the statistics and you will notice a group that goes uncounted. Falling between the lines of child and adult case management, today 2.1 million (6%) of those living with HIV are young people aged between 15-19 years. Where all other age-groups have seen a decrease in mortality rates, for those in their teenage years, mortality rates are increasing. It’s a very real threat, with AIDS-related fatalities now the world’s second leading cause of death amongst adolescents. For the 83% that live in Africa, it’s the first. For these young people, infection is most often a result of mother-to-child transmission. Many do not know their status, and they enter adolescence with little access to age-specific services or healthcare support. This is something we are working hard to change. With 15% of the world’s adolescent HIV cases occurring in South Africa, our teams are determined to address this by providing tailored mentoring and support in clinics across KwaZulu-Natal. Our Nurse Clinicians and Youth Mentors are working with local partners to build a network of accredited Adolescent and Youth Friendly Services (AYFS) that cover a full spectrum of care. 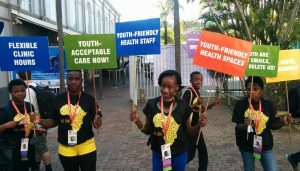 From education and prevention, to diagnosis and treatment – with 35 clinics accredited this year, we are working step-by-step to empower young people in South Africa to realise their right to health. The fight to control HIV is far from over. And if the current trend toward reduced morality is to continue, then the time has come to focus on the needs of adolescents and youth. Theirs is a voice that needs to be heard. Only then can we be sure that #Everybodycounts. To support this work and strengthen health services for adolescents and young people please donate today by clicking https://secure.thebiggive.org.uk/project/28088. Every donation received before midday on December 5th will be doubled through the Big Give Christmas Challenge.